Sean Gregory Animation: A GREEN MIRROR?!?! 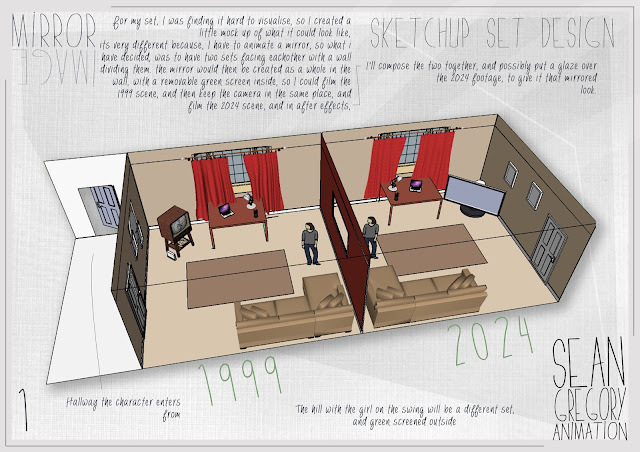 different time) I created a Google Sketch-up design of what I envisioned it would look like. I'm planning making a Green Screen mirror, animating one side (1999 version), taking away the green screen, then animating the other side, (2026 version) and then blending them together with after effects in post production. I then set up my camera, (not a very good one) and recorded myself mucking about with a silicone hand just for a test. One video for one side of the mirror, and another for the other side! This isn't the final look for the mirror, its a very rough test. I'm going to have some help actually designing a texture that will relemble a mirror, maybe with a couple of hand smudges? Mirror Tests from Sean Gregory on Vimeo.